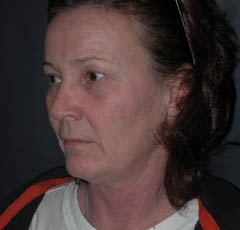 This 48-year-old woman was interested in total facial rejuvenation. She had been a widow for three years and was a smoker, having smoked one pack of cigarettes a day for 30 years. She was bothered by prominent wrinkles on her upper lip, the prominent fat pads on the inside of the upper eyelids, and lax neck skin. She was interested in improving the entire face in one procedure. During her consultation, I recommended upper and lower eyelid surgery, brow lift, and face lift in St. Louis. I emphasized to her the importance of stopping smoking for both her immediate results and long-term health. She agreed to quit smoking six weeks before surgery and to stay off cigarettes for at least six weeks after surgery. Her preoperative examination showed asymmetry of her eyebrows. Unconsciously, she would raise the left eyebrow higher than the right. We used BOTOX Cosmetic to correct the different eyebrow levels. We recommended she undergo a brow lift to elevate both eyebrows and try and make the left eyebrow at similar level to the right. We also recommended that the excessive skin and fat be removed from her upper and lower eyelids. To correct the sagging in the cheek and neck areas, a face lift was needed. The face lift was combined with fat grafting to the wrinkles to give a better and longer-lasting result. She underwent an endoscopic brow lift, placing the incision at the junction of the forehead with the hairline. The excessive skin on the upper eyelids was removed. A lower eye brow lift was performed on both sides. 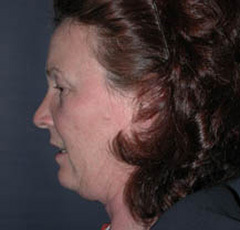 An extensive facelift was performed in conjunction with a neck lift. At the end of the procedure, fat was taken from her abdomen and injected into the wrinkles of the upper lip and the deep cheek folds. The skin around the mouth was then treated with dermabrasion to further improve the wrinkles. The procedure was done under general anesthesia, and she stayed overnight and was discharged the next day. 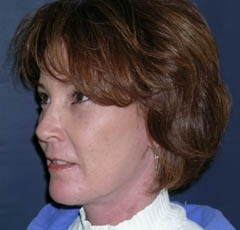 All of her incisions healed beautifully, and the rejuvenation procedures produced a tremendous improvement in one surgery. Photographs are shown 10 weeks after her cosmetic surgery in St. Louis. She is now using a medically based skin care system. Her friends and family can hardly believe the results.